Locking Dome Strainer Replacement Kit - 3"
The Locking Dome Strainer Replacement Kit is a new product designed for food service businesses, such as restaurants, to save you money by reducing drain cleaning costs significantly. It is the only product on the market with triple protection for floor sinks and floor drains. Plumbers regularly find items, such as straws, silverware, cloths, plastic gloves, broken dishes (such as ramekins) in the drain lines of these food service businesses. Unfortunately, staff members or other workers accidentally or purposely remove or discard the sink strainers on a regular basis during cleanup, which causes jammed or clogged drains filled with unwanted items. Why does this matter? These items often cause massive drainage and plumbing issues at the most unwanted and unexpected times. These preventable drain back-ups are the source of immense business headaches, interruptions, and losses of time and money. Sadly, without intervention, this trend becomes a vicious cycle that continues to take place in food and drink preparation areas. Is there something available to assure owners and management that this unfortunate situation will not continue to wreak havoc on the drain system? The answer is yes, and the solution is the Locking Dome Strainer Replacement Kit. Saves money by reducing up to 95% of drain cleaning expenses on drain lines protected by the Locking Dome Strainer. Reduces business downtime caused by blocked drains. Provides a more sanitary environment, with less backups in buildings. Protects drain lines, since less blockages means less damage from cables. Lessens costly drain line replacements caused by major blockages. The Cross-strainer prevents large objects from entering the drain lines. The Dome-strainer has more drain openings than a flat strainer and catches smaller objects and debris without stopping up the drain lines. Tamper-resistant screw deters removal of the dome strainer to ensure proper function. 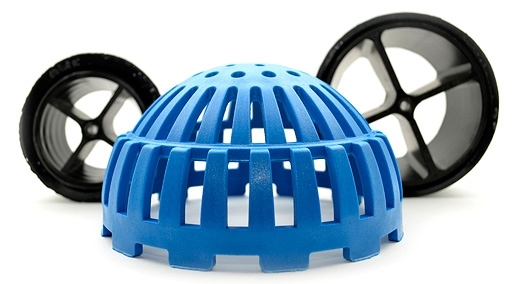 Q: Can I still use my current dome strainer? A: Yes, in many cases you can use the gasket and screw with your current dome strainer to make it a locking dome strainer. You can then keep the plastic dome strainer as a spare or use it in a different location. 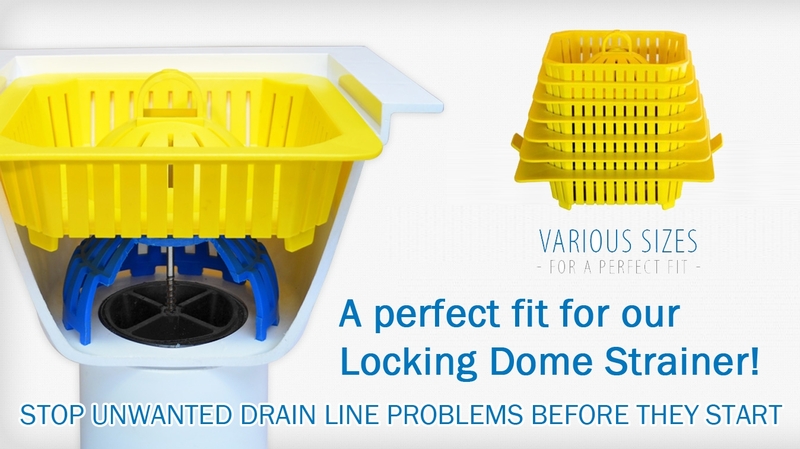 Q: Will the Locking Dome Strainer work with a floor sink basket? A: In most situations a floor sink basket won't work with a dome strainer. That is why we have designed a new floor sink basket to fit over the dome strainer. These baskets will soon be available online. Please call our sales office to find out more. Q: How do I measure my drains?